If you have a copy of Phaidon’s Design Classics (and everyone really should), you’ll notice at number 609 is the Makaha Skateboard – the first professional-quality skateboard to hit the stores in 1963. And if you want to own a piece of history, you’ll be pleased to know that the skateboard’s originator, Larry Stevenson, is selling reproductions of his original boards. The Makaha 1963 is a reissue of the first board – 29" solid oak or ash deck hand-crafted to the exact design and dimensions as the original. It comes equipped with NOS SureGrip loose ball bearing trucks and Makaha clay wheels, plus original 1963 decal. The trucks are not drilled through – they’re attached with wood screws exactly as they were in the 60s. Selling with a collectible booklet and DVD, stock is limited, with each board retailing for $159.99 (around £82). Or if you’re feeling a little more flush, check out the Originator Limited Edition Signature Series – a repro 70s board with patented kicktail and signed by Larry Stevenson – yours for $399.99 (around £205). And big thanks to Leslie for the tip off! Geeze, I had one of these in 1963, I paid like $18 for it! 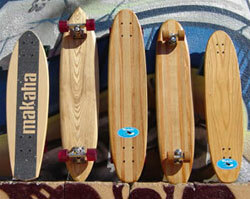 we would like to buy the makaha skate board.what is your phone number?